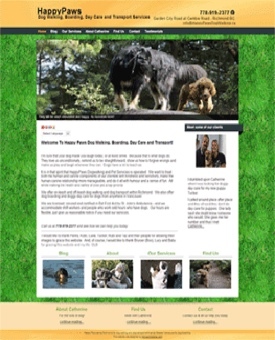 Catherine, the owner of Happy Paws Dog Walking, wanted green as the main colour for her website, so we created a colour scheme that features green with complementary colours that makes her website “pop”. 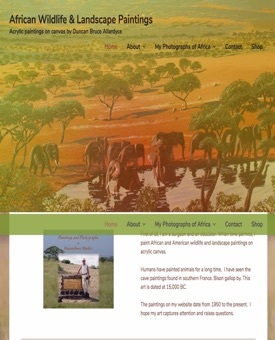 The site also has many features like a language translator, doggie slide show, map and more. 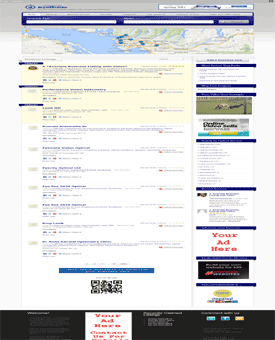 The owner of this printing company hired Noticedwebsites to update his website. 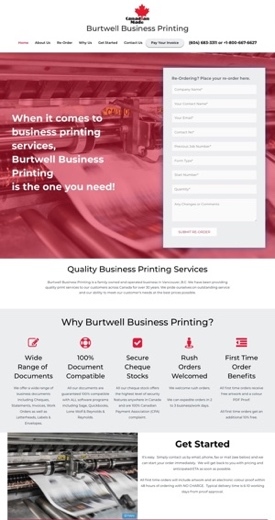 Burtwell Printing now has a modern looking, functional website that better serves its existing customers and converts new ones. Eventually an ecommerce payment button will be added to the website, linking to Burtwell Printing’s credit card payment page. 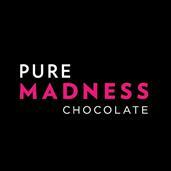 This will give its customers the convenience of paying right from the site. 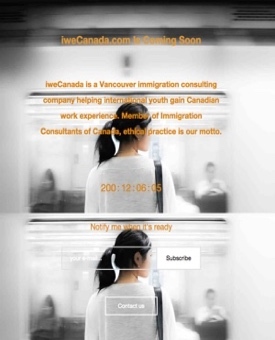 iweCanada’s coming soon page uses a photograph of a young person catching a subway on the way to work, perfect in keeping with the theme of what iweCanada does. The page also has a countdown timer, subscribe and contact us features to capture people interested in iweCanada’s services before its website is finished. 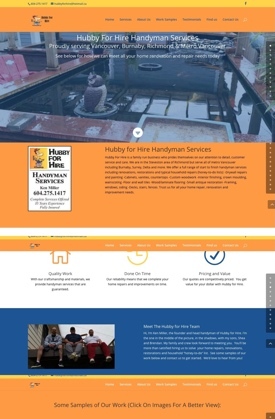 We also recently designed a one page website, Hubbyforhire.ca. 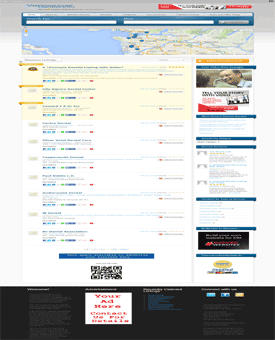 With this design, there are multiple sections within one website page. This site features a hero image, before and after, about sections, animations and more. This design is popular now because people can conveniently scroll down to read each section from their smartphones, which they’re increasingly viewing websites from these days. Note though, with an one page web design, it’s harder to optimize this design for local SEO (search engine optimization) due to the one page’s different sections. The old Vancouver-Santa site’s text was unfocused. It did not really answer what prospective clients wanted to know about Santa in deciding whether to hire him. The site also had no call to action contact form and its colours and balloon background did not go with its Santa theme. As well, the site was hard to read and navigate, especially on mobile devices where a lot of people now view websites from. The new Vancouver-Santa now “pops”. Its image of Santa and reindeer flying in the evening sky as its header and background image goes with its theme and conveys a “Night before Christmas” feeling. The site’s trim colour and text colour in one section matches the image’s shade of blue, giving the site colour consistency. Perfect for any service business like Santa’s, the site has a calendar. People can now see Santa’s availability on any given month. An added call to action contact form encourages people to contact Santa after viewing the calendar. 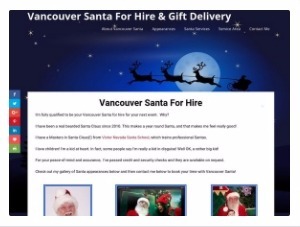 Click on the image to view the redesigned Vancouver-santa.com. 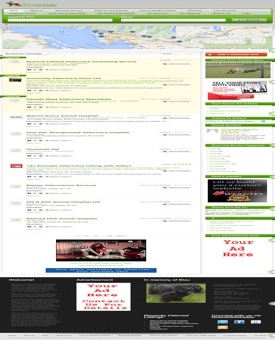 Vancouver-Santa.com now looks polished and performs well. It’s user friendly. The site is easy to navigate. Its top menu links to each of the six sections and has a back to top button. It’s also easy to read on desktop, tablet and smartphone, and downloads fast. This is important as Google tends to list websites higher that give a good user experience. Click on the above image to see its performance numbers in large view. I designed and launched these three directory websites, Vancouver Dentist Info, Vancouver Eye Guide and Vancouver Vet Info to meet the trend of people researching businesses online first before contacting and buying from them (Source: Hubspot.com marketing statistics). These directories list practices, which can be claimed by their owners and visitors to the directories can give and read customer reviews of practices listed on these directories. The directories also have informational videos on them as well. 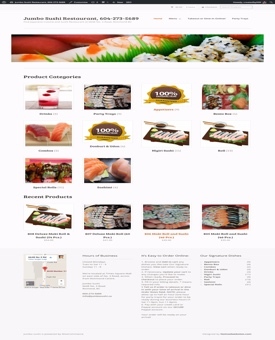 JumboSushi.ca wanted a basic ecommerce website, nothing fancy, with basic information about its restaurant. Jumbo Sushi’s site was designed to make it easy for people to browse its menu and find contact, hours and location information However, unlike most restaurants that just list their menu on their website, ecommerce was added to Jumbosushi.ca so that customers can easily order online from the site. An artist contacted me to redesign his old, out-of-date website and add ecommerce functionality to it. Bruce-art.ca is the result. Bruce-art.ca was redesigned to be user friendly. 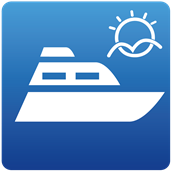 It’s easy to navigate, has built in search, related painting suggestions and a currency converter for its out of country visitors. The big challenge was the myriad of shipping and pricing possibilities of buying this artist’s paintings. Each painting is a different size and hence, each paintings’ total price can vary widely depending where it is shipped to. A flat shipping price by country or even an area was not doable. I therefore modified Woocommerce, which powers Bruce-art.ca’s ecommerce, to give a custom shipping and pricing quote once visitors submits information on where they want their painting shipped to. A Paypal invoice with a custom quote is then emailed to the person to complete payment prior to delivering the painting to her. Note that the Bruce-art.ca’s web performance is exceptional. As seen from the above chart (click to enlarge), Bruce-art.ca downloads less than 3 seconds most of the time. despite having to download 34 paintings, which could slow the website down. Each of the 34 paintings were optimized to minimize this. This is an important because Google tends to list websites higher that give a good user experience. That is, Google detects whether a website loads fast, is easy to navigate, “sticky”, looks good on mobile devices, etc. 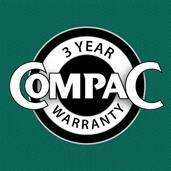 as one of its many factors it uses to rank a website. Click on the above image to view it in enlarged mode. A profile/introduction video for a local realtor in Vancouver. It was produced under the realtor’s direction. The realtor uses it on social media like YouTube to drive traffic to convert on his website, RichVancouverRealEstate.ca. Note: I can animate your logo to give it a Hollywood effect as was done for these videos. You can then use the file to add to your videos. Brand your videos and make them standout. Your first animated logo is only $27. Really give a sense of your home by highlighting its features with a call to action in a video. Just supply your home photos and what text you’d like on your video and I can create a custom listing video for you. This example listing video has no voice over, but one be added, if so desired. I can do a similar videos (opens in a new window) like the ones above for you to profile your business, demo your products or services, etc. Just supply me with your images or I can supply some as well with what you’d like to say on your video to get started. Contact me below to get started. I also offer a virtual home staging service. 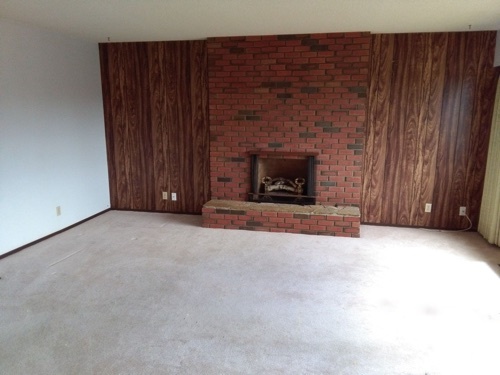 If you have an unfurnished home and want to show different looks to potential buyers or don’t want the time and expense of staging your listing, I can virtually stage the home for you. How it works is email me your photos of your unfurnished rooms with an idea of the type of decor you’d like, if any. I will then virtually stage these photos and email them back to you for your approval (up to 2 edits allowed per photo). 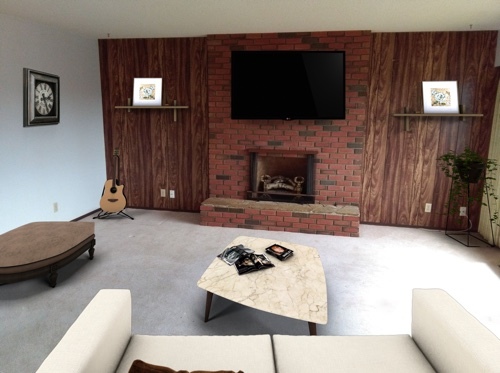 The virtual home staging service starts at $50 Canadian per photo. If interested, please contact me below.